I had the pleasure of conducting an interview with Cary Christie, the founder of Artison speaker company to chat about his company, Artison's products and how their speakers fit into the gaming and home theater . Cary was the co-founder and CEO of Infinity Speakers along with being the CEO at Acoustic Research for 30 years prior to founding Artison. Below is our interview, along with some additional details that Mr. Christie provided on the rise of sound bars have had within the home theater industry. Can you please introduce yourself, your background and your role within Artison? My name is Cary Christie and I have been in the audio business for more than 40 years. I was co-Founder and CEO of Infinity (25 yrs. ), CEO of Acoustic Research (5 yrs), and most recently Founder and CEO Artison (12 yrs). My true passion lies within product innovation, engineering and development, and I've been fortunate to have patented several audio concepts throughout the years. With Artison still relatively young (est. 2003) when it comes to consumer electronics, what can you tell me about the company and its background that the average consumer wouldn’t be aware of? After seeing the first consumer Plasma TV display at a Comdex show in the late 90’s, I developed a speaker, Phantom, that was the first model specifically made for flat panel displays. It made sense that consumers would want a new type of speaker to go with their new sleek televisions that was equally as stealth and unobtrusive in a room, but lived up to the expectations of an immersive audio/video experience. Over the next several years, I developed a successor to Phantom that incorporated significant improvements for the integrators and end-customers. I felt strongly that the flat panel television was going to take over CRT technology and speakers that seamlessly integrated into this new type of display would be in high demand. Artison was created to develop new types of speaker technology that would give customers an amazing audio experience while complementing the physical design of the flat panel display. We were the first to focus on high-end audio for flat panels and the first to enable color customization to match any décor within the room. When looking over the current product lineup, I noticed a distinct trend of products that are designed to complement the environment as well as the other A/V gear with attachable speakers, in-wall products (speakers & subs) and custom grills. What led Artison to take this approach when engineering and designing your products and what types of principals are used as guideposts when influencing the creation of a new product line? It’s no secret and in fact it’s almost a joke that women and men don’t like large obtrusive speakers that interfere with the décor of their home. We have lived with this trend since the invention of the loudspeaker and have tried to accommodate this mind-set by elegantly designing our traditional floor standing and bookshelf speakers to blend into the room versus stand out like an after-thought. Stereo was challenging enough, but with the addition of 5.1-channel audio, the demand for more integrated (stealth) audio is paramount as one of the criteria for every product Artison has offered since we introduced our very first model, the Portrait LCR. Being an old audiophile, I also require that our focus on blending in with decor should not force anything less than state of the art performance from our product, so we obey the laws of physics (acoustics) and produce only the finest at very accessible price points. 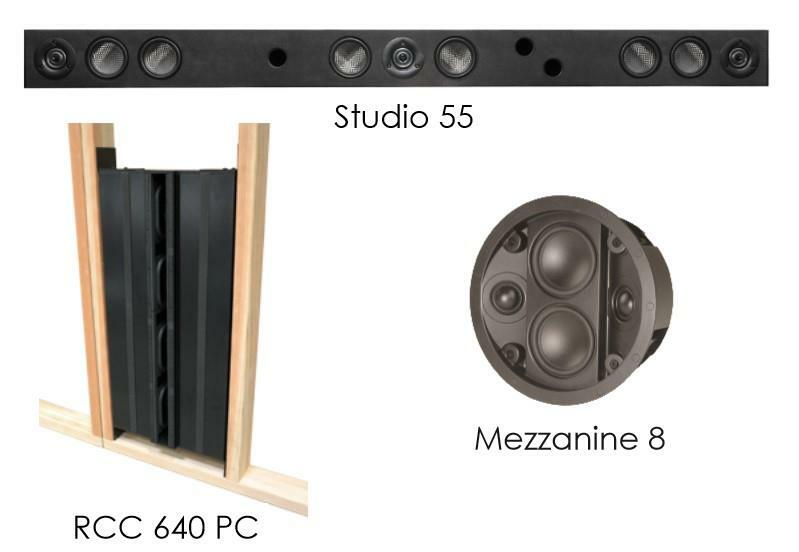 In fact, many of our current products feature custom grilles that make the speaker match the height (LCR Line) or width (Studio Sound bars) of the display so that we can hide the speaker in plain sight. It's a fine balance between developing high-performance products that are complementary in décor, but it's the core of our product development principle that we consider for every product. I have had the pleasure of reviewing the Nano 1 (along with the Studio 46), what can you tell me about how this sleek little sub came about? We wanted to make the ultimate subwoofer that would have applications in smaller rooms (normal apartment size) that was state of the art, with a compact, micro-design, yet could deliver a big punch. The lower you go in frequency, more air volume that needs to be moved with each cycle of the speaker piston. This typically requires a large enclosure to accommodate the drivers needed to move the air. We couldn't get away from the reality of physics, so it forced us to re-think Artison's subwoofer designs. We came up with a dual-driver system where two opposing drivers are configured in a way that the reactive forces (Newton’s 3rd Law) would cancel one another out and not waste the energy that typically moves the low frequency around the room. This substantially increased the efficiency of air movement within the enclosure, which in turn improved the sonic accuracy of the Nano and, as a byproduct, completely eliminated the vibrations that almost always accompany subwoofer designs. The size obviously makes the Nano a great solution for smaller rooms without sacrificing the high performance expectation. It appears that the Nano is your first free-standing sub to use Artison’s Reactance Cancelling Configuration (RCC) vibration free technology, what were the challenges adapting it to the smaller free-standing Nano versus the in-wall subs Artison had used it in previously? Our first RCC subwoofer was created at the same time that our first LCR was made back in 2003. It was called the RCC 210 and it worked perfectly. However, we were focused on the flat panel speakers at the time, and didn’t do a great job of marketing the RCC technology within the subs. Over the years, we have perfected the RCC technology and offer several different in-wall models to accommodate any room size. The major challenge with the Nano sub was to ensure the quality, clarity and power of the RCC technology was not sacrificed within the smaller footprint. I think we nailed it and the Nano sub is quite an achievement for Artison. As for the Studio 46 and the other two surround (Studio 39 and Studio 55) bars in the lineup, what led to the decision to use carbon fiber in the design of the mid-range woofers? What makes these bars so rigid and heavy, as I was a bit surprised at the gauge of aluminum that is used not only for the chassis but also for the mounting bars. Carbon fiber is what I call an engineer-able material, which means when you design a driver, the production units turn out to be the same every time. There is very little change from engineered prototypes and production. Carbon fiber also features very good stiffness / mass properties so they maintain low distortion to fairly high frequencies. Regarding the aluminum cabinets, the amount of energy that is generated by high performance speakers can create a lot of pressure in a box, and even aluminum can bend under these conditions. We designed the aluminum to have the effective bend mode strength of 1” thick MDF or better, and now use it within all of our products as standard protocol. One of the obvious benefits of aluminum are that we can develop a much thinner wall thickness versus other types of material, and still achieve the strength needed for the enclosure. After all, we need as much inner volume as possible for performance, but we also need the cabinets as small as possible on the outside to make them fit on thin televisions. How has Artison product development adapted to the evolution of centralized entertainment hubs in the household that has occurred over the last decade? More so than ever the gaming, TV, movies and music are all emanating from the same location in the house and the audio system needs to be able to handle all types of media. My viewpoint on audio reproduction is very simple: The whole goal of high performance audio design is to take a recording of an original performance, at a time and location and exactly reproduce it at a different location and time. That has always been my goal. Whether we are listening to Also Sprach Zarathustra (Strauss) or watching 2001 A Space Odyssey, the only difference should be that one of them has a video (movie) that goes with the music -- that’s it. In short, a person should sound like a person, a plane like a plane, an instrument like that instrument…picture or no picture. Also, the dynamics for gaming, music, and movies are not the same, so one system must suit all applications where AV is involved. Our multi-channel audio systems have always compared favorably with free standing and bookshelf speakers by some of the top reviewers in the industry. The need for an audio system and a separate AV system in the same room are gone as one system can provide an excellent experience with games, movies, music, communication, or entertainment. I noticed that one thing Artison doesn’t produce is your own line of freestanding amplifiers or Home Theater receivers. Is that something the company may be looking toward for the future? Is there a specific receiver or company that is currently recommended to accompany Artison’s products in order to maximize performance? We introduced Nano Backpack, our first purely electronic product, at CEDIA 2015 and it was a huge success. Backpack, which will ship in June, is a small, full-featured, high performance electronics hub that is intended to be used in conjunction with a television. The Backpack allows for the creation of a 5.1 channel system that is self-contained, high performance and yes, stealth as it will fit on the back of any current flat-panel. These room systems can work with a centralized CI type of installation or can work independently in a multi-channel application. You will see more of these kinds of products from us going forward. Additionally, there are a number of high quality receivers on the market that will all work well with our speakers. Despite being a gaming-based website, our readership tends to skew toward a more mature (30+) age demographic that has the means to get into higher-end A/V gear to accompany their gaming (entertainment) hubs. What would you suggest to our readers to consider Artison products for their home theaters, man-caves and family rooms? As I mentioned earlier, accurate reproduction of any source material, with the ability to provide an immersive experience that will blow you away! Artison products are designed and developed to the highest standards and will make you take notice of the audio experience once again. When your customers are ready to exceed their expectations of high-resolution audio experience for flat-panels and TV's, they will want to consider Artison. If you were asked to create the perfect multi-functional audio system to accompany a small (15x15) six-seat home theater projector room (96" widescreen) used for gaming, movies and TV, what Artison products would you use to build this out and why? In this particular scenario, cost is not an issue. With an acoustically transparent screen, I would locate a Studio 55 behind the screen, centered for proper vertical and horizontal positioning to integrate the audio and video. In addition, two RCC 640 in-wall subwoofers (no need for boxes) and a pair of Mezz 8 surround speakers. This would be an exceptional audio system that will provide massive performance, with every type of source material, at a relatively accessible price point. The bonus is the speakers would be virtually hidden within the room. Can you recreate this same room and experience with Artison products for the person that wants to keep costs in check, but wants the most "bang-for-their-buck"? Artison products are designed to be the best performance to value in the market. Naturally there are solutions that are less expensive, but the customer experience will be limited. This limitation could manifest as sub-par audio, obnoxious design, or unpredictable reproduction when using different sources. If you have readers that like to experience audio to the fullest, and have the system hold up to the dynamic demands, Artison will fulfill this need at a price point that won't break the bank. What kind of impact have sound bars had on your business and the consumer electronics industry, including manufacturers and retailers, and why? When plasma televisions became the replacement for CRT, there was an obvious a need for an audio system that would work with this new type of display, both acoustically and visually. Artison responded with an LCR attachable speaker that was shallow (like the televisions) that utilized two center channels, placing the “dialogue” in the middle of the screen. However, we continued exploring designs that would create an enhanced A/V experience without cosmetically dominating the room, like traditional speaker boxes did at the time. When sound bars entered the scene, bringing with them ease of installation and a demonstrable improvement in sound over the TV's speakers, consumer acceptance was quick. We developed the Studio Series sound bars with the goal of bringing the high end fit, finish, and sound quality that our customers are used to from Artison products. We also adapted an idea from the LCR series...the ability to have custom grills. All of our sound bars have a grill that is custom cut to the width of the TV, so it looks like it was made with the TV, not an afterthought. Once installed you don't even realize they are there...with the exception of the incredible sound improvement. They are very well received by dealers and consumers alike, and continue to be some of our best selling products. Have sound bars been a net positive or minus for speaker makers and CE retailers, and why? Sound bars have and continue to be an unequivocal success for manufacturers, dealers and end-users. When designed properly, a good sound bar will sound incredible and cosmetically blend with the environment. They continue to grow as a product category due to the improvement in sound quality, ease of installation, and minimal impact on the cosmetics of the room. What product category have they had the most impact on, and why? Home theater in a box-type products -- if so, why? They have greatly impacted the typical "box" speaker. For years the only way to get acceptable sound quality was to have large speakers throughout the room, taking up valuable floor space, and distracting from the cosmetics. The ability to attach the sound bar to the TV, have it blend with the environment, and have in some cases very good sound, diminished the need for large speakers. "Home theater in a box" brought with it the ability for a consumer to easily buy and install the system themselves, with little to no knowledge. They no longer needed to hand pick each piece of equipment and make sure it worked together, so it was easy. Separate components such as our Studio Sound bars will continue to grow as consumers want better sound and integration beyond what the "home theater in a box" is capable of providing. Can you please provide details on when and why your company started making sound bars, how they have been selling so far, and whether sales of your other speakers declined after you introduced sound bars (if so, by how much)? We launched our original sound bar the SB1 in 2007, and then in 2012 we introduced a new series of sound bars to fit even thinner TV's, the Studio Series. The Artison sound bars sell extremely well, and I believe they will continue to grow for us as a product category. With the introduction of the sound bars, sales of other speakers increased. We believe that this was due to the overall visibility of the Artison brand and product line. Our LCR speakers, which attach to the sides of the TV's and sound incredible as well, continue to be a high demand product. The use of a sound bar or LCR speaker impacts the overall look of the TV. Adding a sound bar to the TV gives is a more overall square look; whereas adding the LCR's give it a widescreen appearance...cosmetically different people prefer different looks. What kind of customers are buying your sound bars and sound bars industry wide vs. other speakers, and why do you think that's the case? Our customers are buying our sound bars for a number of reasons -- first and foremost, performance is the most important factor, in addition to cosmetic integration with displays. Our products are at the upper middle end of the category, tailor made for a consumer who knows and appreciates a better sonic experience, not someone who simply wants to spend a few hundred dollars for "loud TV". The ability to integrate sound with the display, and remove the "box" speakers from the environment, is a key factor in today's installations, and this is something that Artison has built its foundation upon...Incredible sound integrated into the environment. On behalf of GamingNexus, we would like to thank Mr Christie for taking time to answer our questions. Additional information on all of Artison Products can be found at Artison Website, along with dealers that serve your area.